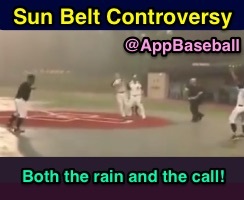 Appalachian State batter Travis Holden nearly pulled off an inside-the-park home run in the rain during the Mountaineers' game vs Coastal Carolina Friday, but a controversial call after a brief delay upstaged the home team's celebration as the umpire who made the call scurried off the field toward the visiting dugout. Ump rings up Holden to dash his HR hopes. Per the official box score, Friday afternoon's crew as assigned by the NCAA Sun Belt Conference featured HP Umpire Craig Mirr, 1B Umpire Jeremy Hayes, 2B Umpire Nathan Huber, and 3B Umpire Gabriel Chavez. Welcome to the UEFL's new Humor section, where we visit the more jovial parts of the officiating game—from bloopers to satire and downright foolishness that's guaranteed to put a smile on your face. Imagine our annual April Fools' Day content, but on a more routine basis. Welcome to UEFL Humor. *All UEFL Humor entries will carry the "Humor" label and be denoted as such in the post's content. As for the game itself, Holden's non-inside-the-parker occurred during a terminal rain delay that ultimately resulted in the game's suspension in the bottom of the 6th inning with Coastal Carolina leading, 7-4.